"Recorded in Berlin at the old chamber-music hall from the thirties, which seemed perfect to capture the warm sound of two bassclarinets and the clarinet. A number of improvisations as a trio, duo or solo highlight certain abstracted idioms as well as the different musical backgrounds of the musicians. Jürgen Kupke who has been performing from contemporary to New Orleans type music, Theo Nabicht who focuses on today's composed and improvised music and writes music and theatre, and myself who has been composing and performing in the large field of what I think jazz is. ... We hope you will hear some of that autumn Berlin sun in this music." 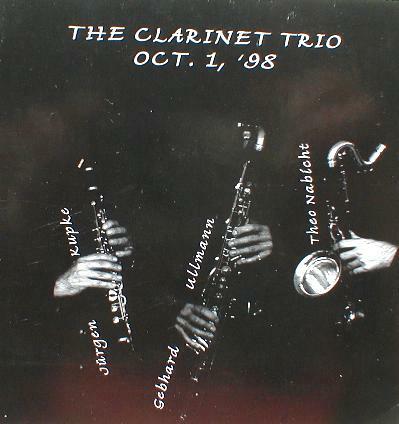 Gebhard Ullmann - bassclarinet, Jürgen Kupke - clarinet, Theo Nabicht - bassclarinet.